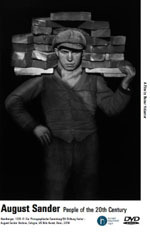 The film August Sander – People of the 20th Century premiered in June 2002 at the Photoespaña 2002 in Madrid. The work of German photographer August Sander (1876-1964) had a decisive influence on the history of photography and art. With his portraits, he documented the first three decades of the 20th century more comprehensively than anyone else. Starting with his portraits of farmers taken in 1910, Sander photographed people from different social classes in Germany, thus providing later generations with an authentic picture of his time. Sander's most productive period was in Cologne during the 1920s and '30s. During those years he created an oeuvre of portraits which would ultimately comprise over 600 photographs. In 1929, as a preview of this carefully planned document of contemporary society in portrait form, he published a selection of 60 photographs entitled Antlitz der Zeit ("Face of Our Time"). During the Nazi period Sander's work was forbidden, for failing to conform to national socialist aesthetics and ideology.